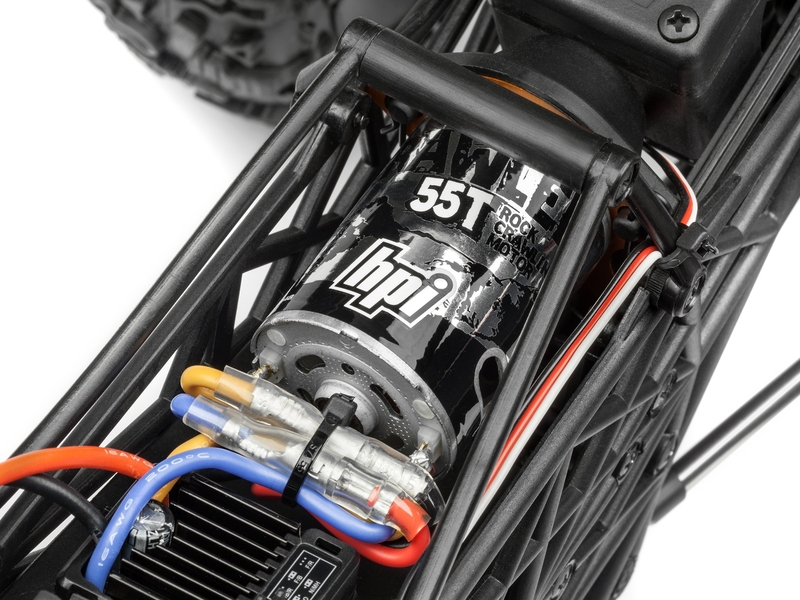 Rule the roost with the HPI Crawler King! This gives the Rover tires at all four corners the grip and traction needed to pull the Crawler King up impossibly steep angles. 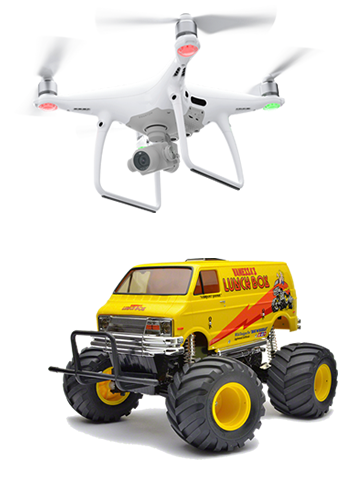 The battery is secured in the front of the chassis, above the front axle, to give the Crawler King the best possible weight distribution, and enclosed receiver box let you take the truck through mud and across streams without worry. The Crawler King is topped with an awesome 1979 Ford F-150 body for a fantastic retro scale look. Finishing off the Crawler King are beadlock-style wheels and the awesome-looking Rover tires. The Crawler King is super-easy to drive and get familiar with - to drive the truck, simply pick up the controller with your left hand, put your left index finger into the trigger area, and then put your right hand on the steering wheel - it's as natural as driving a real car! 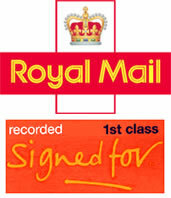 Turn the wheel to go left and right and gently pull on the trigger with your left index finger to go forwards. To brake the truck and come to a stop, gently push away from you with your left index finger. 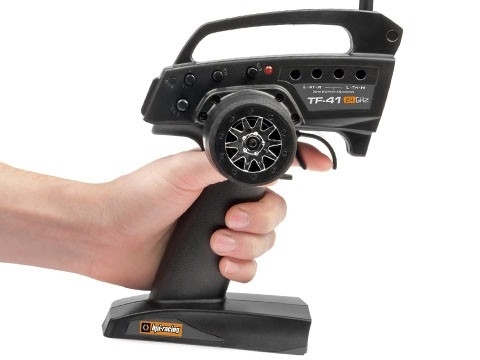 It takes just seconds to get used to driving an RC car, and soon you'll be doing climbing rocks and hills with ease! 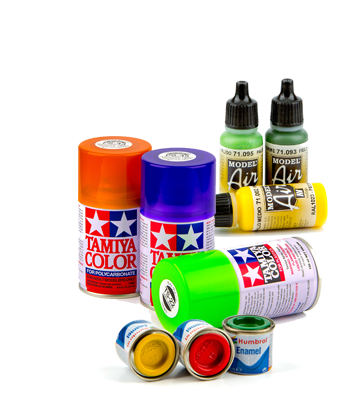 The standard RC battery included with the Crawler King kit fits easily into a protected battery box at the front of the chassis. 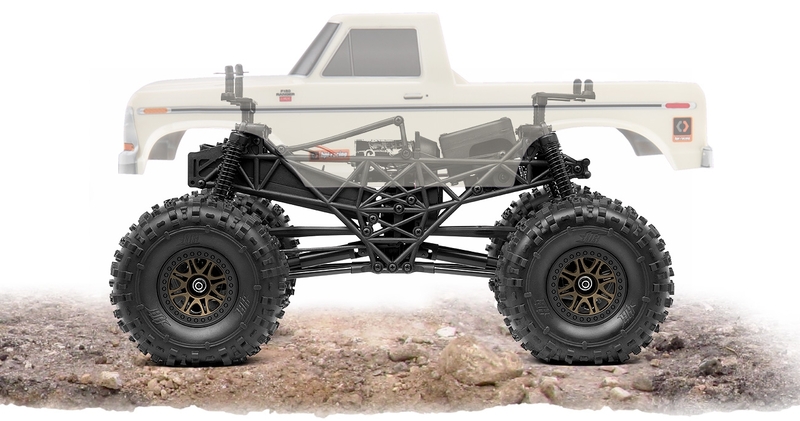 This forward mounting gives the Crawler King the best weight distribution for climbing steep terrain, making sure that most of the weight of the truck is over the front wheels. 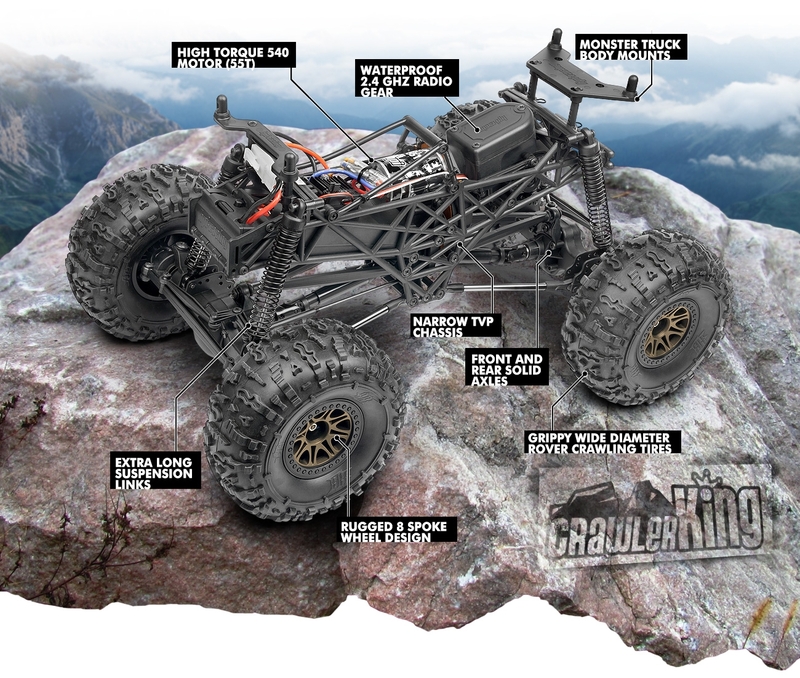 One of the coolest things about the Crawler King is that the suspension and drivetrain are based on actual off-road trucks! 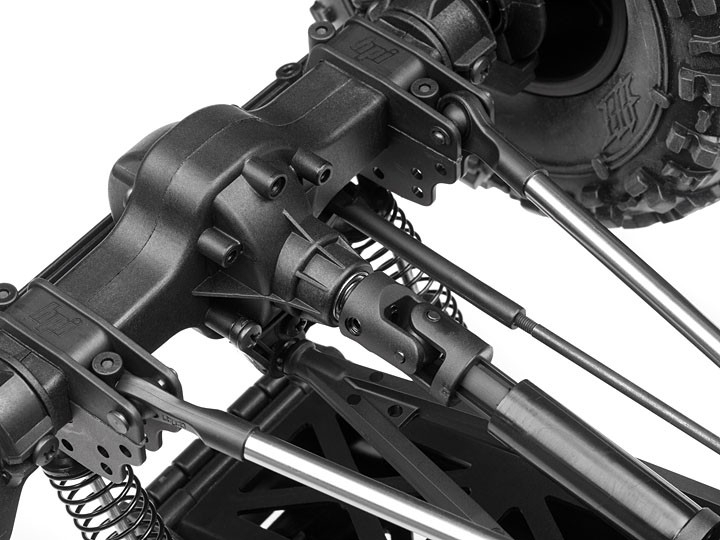 The 3-link design features 2 aluminum lower links and a single Y-shaped upper link that give the Crawler King tons of articulation, which allows it to get the traction down on the roughest of terrain. 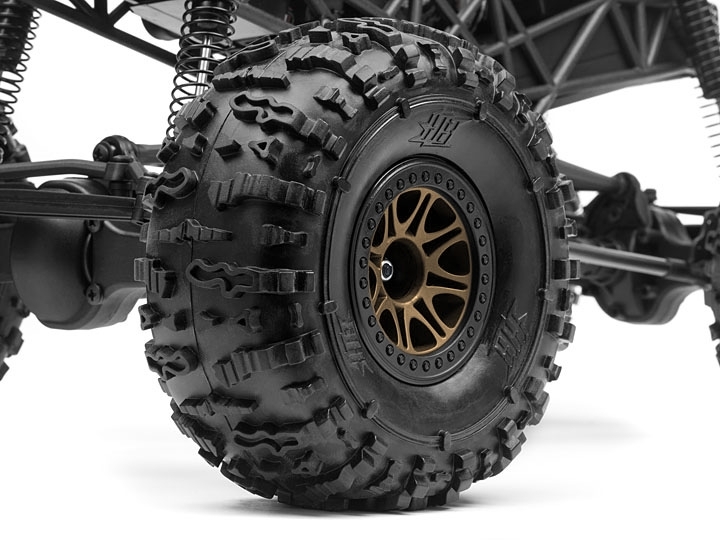 Just like classic off-roaders, the Crawler King is fitted with real straight axles front and rear, which lets you put the power down when you need to. 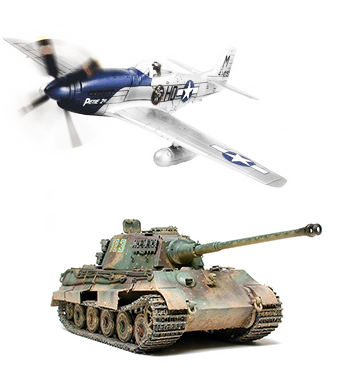 Most importantly, they let each of the tires contact the ground at exactly 90 degrees for the largest contact patch and maximum grip and traction! 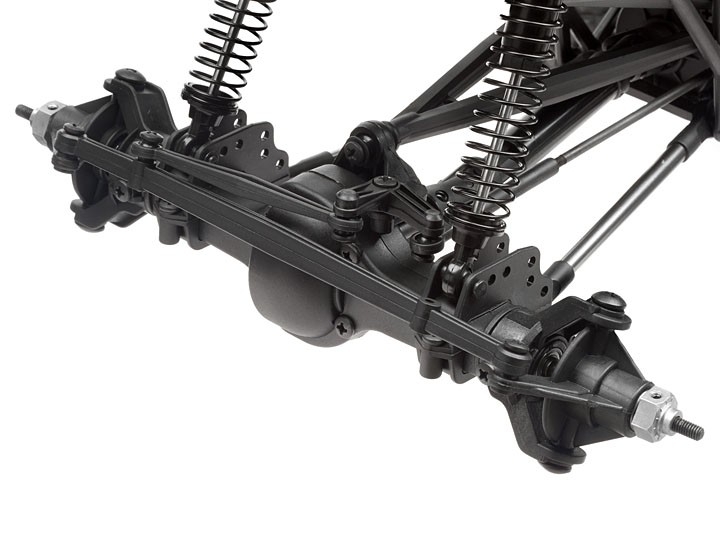 Extending driveshafts form the core of the Crawler King drivetrain, connected to the central transmission and leading to the straight axles at each end of the truck. 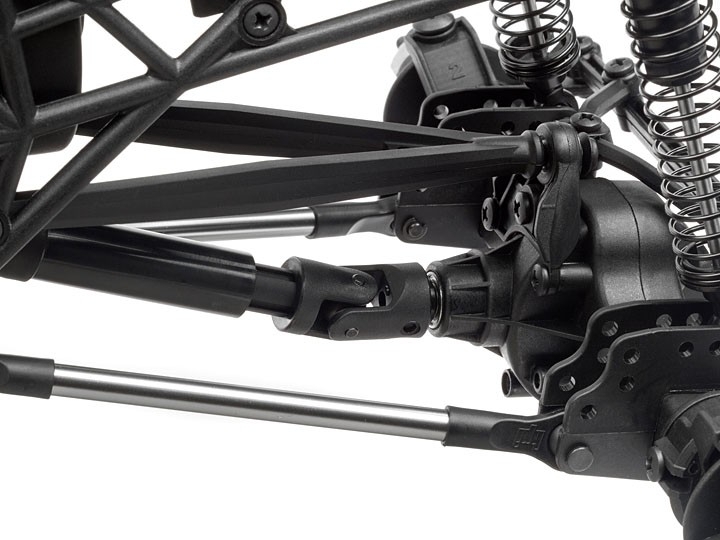 The rugged composite design allows them to transfer all the power from the motor to the locked gear differentials in the axles, to get all the power of the 55-turn motor to the tires! 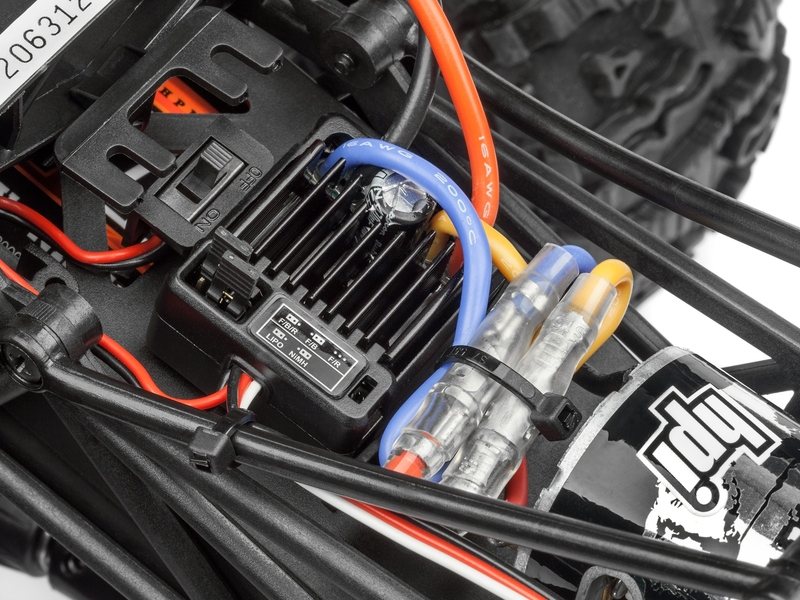 The brushed crawling motor fitted as standard equipment in the Crawler King is the tried and tested HPI 55-turn Saturn motor, a true workhorse that puts the maximum torque through the transmission and into the driveshafts. The brushed design of the motor is perfect for tough conditions like water, mud and snow, making it perfect for long off-road runs! 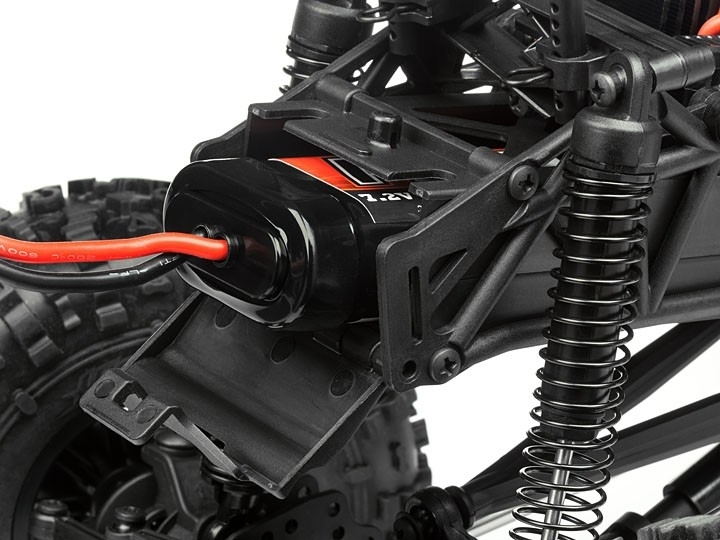 The HPI SC-3SWP2 speed controller is the brain of the Crawler King, taking the signals from the receiver and telling the 55-turn Saturn motor how much to spin. 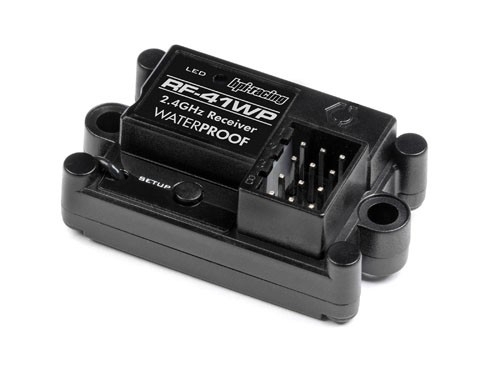 Its element-proof design allows the Crawler King to pull itself through rough and wet terrain, and the standard plugs let you use extra battery packs or optional motors in the truck very easily. 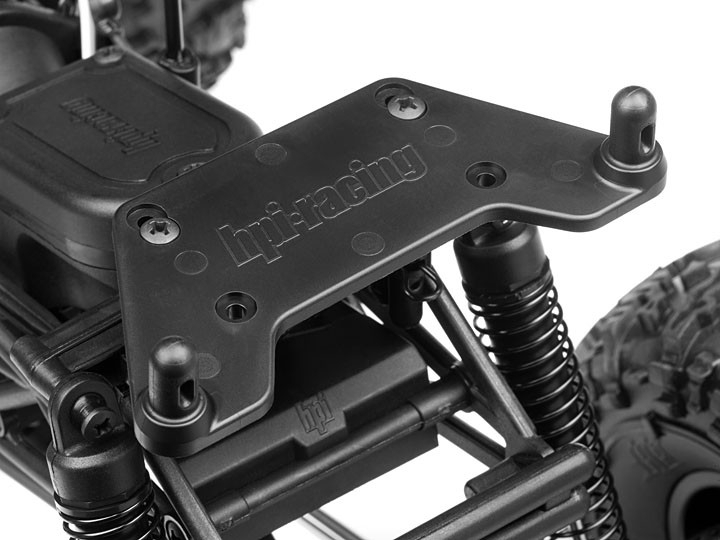 Changing the look of the Crawler King is very easy with the standard-fit body mounts! 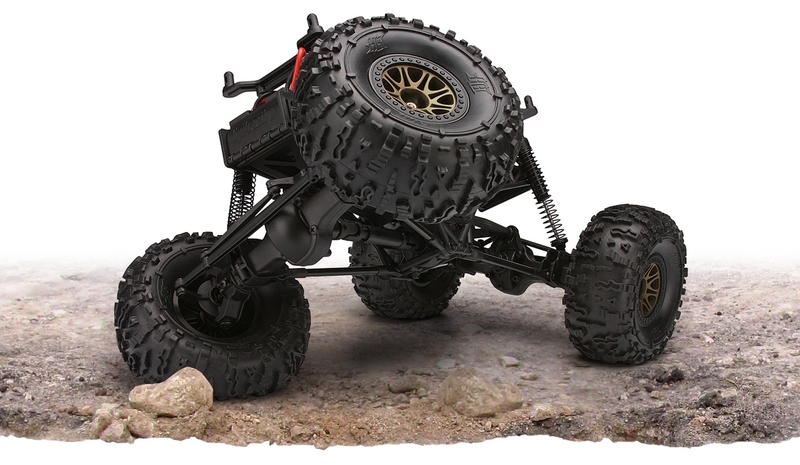 You can fit all RC monster truck bodies from HPI using the standard body mount holes, and the body mounts even adjust easily up and down to let you fit SUV-style and pick-up bodies, so you can update or change the entire look of your Crawler King in seconds! 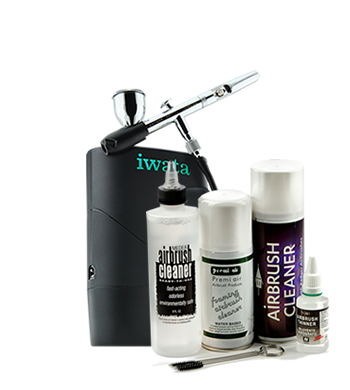 The Crawler King kit includes a 2000mAh 7.2V NiMH battery, universal wall charger and 4 HPI Plazma AA batteries for the radio transmitter. 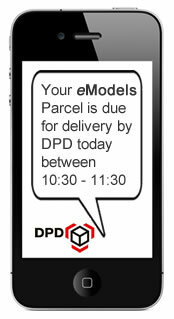 You don't need to supply a single thing to get driving! Simply unpack the truck, plug the wall charger and battery in to charge and install the AA batteries in the radio handset, and you'll be driving in no time!